Ferdinand Konščak, a Croatian, (variously also Fernando Consag, Konsag, Konschak. was a Jesuit missionary, explorer, and cartographer. Konščak was born in Varaždin, Croatia, and attended primary and secondary school in his native city. 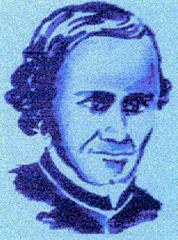 At sixteen he finished the expected grades and was admitted to the novitiate of the Society of Jesus in Trenčín, Slovakia, In 1729, Konščak left for Cádiz in Spain, then went to North America, where he was active as a missionary on New Spain’s Baja California peninsula (today part of Mexico), from 1732 to the end of his life. His headquarters was at Mission San Ignacio. From 1748 he acted as the superior of the mission and later, in 1758, inspector of all missions in Baja California. Konščak spoke various dialects of the local Cochimí language.